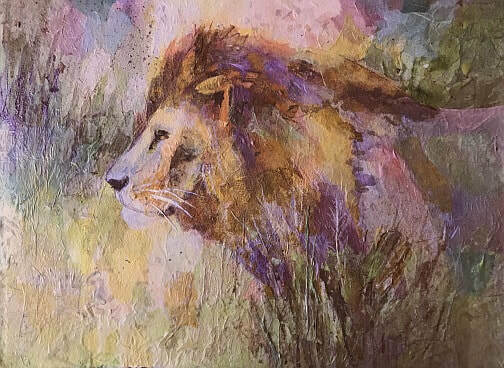 Madikwe Majesty ©Carolyn Wilson, mixed media, 16" x 20"
Toby's Tulips ©Carolyn Wilson, Mixed Media, 12''x 12"
Follow the blue signs along the roads to find your way to the open studios. All are identified by their studio number. Look for 88 to find me. Art Workshop - Apple Blossom Art Show. More than 20 broken and unplayable instruments were turned onto unique one-of-a-kind and creative works of art.Buy your event tickets online here. $25 each. Location: SRJC Shone Farm, Forestville. Music by the Youth Orchestra String Quartet, waltz lesson and dancing, dessert, champagne, silent and live auction. Funds benefit Santa Rosa Symphony Youth Orchestra - summer concert tour to Vienna and Budapest. 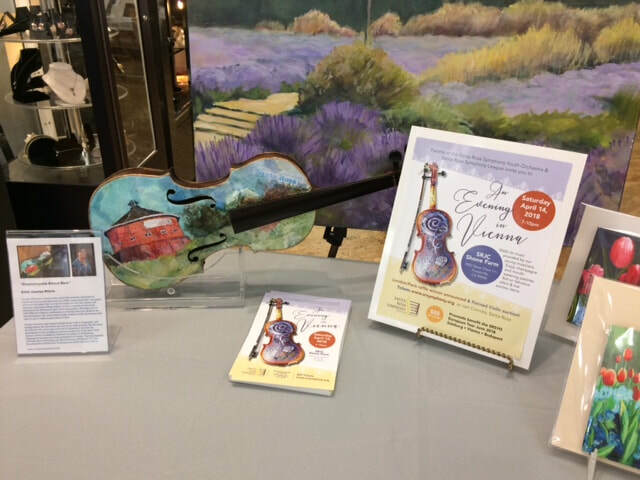 Painted violin by Carolyn Wilson will be auctioned April 14 2018. Artists 9 group show at Santa Rosa Metro Chamber, 50 Old Courthouse Square, Santa Rosa. November 17 2017 thru March 2018. Artists 9 have been meeting regularly for for 6+ years. 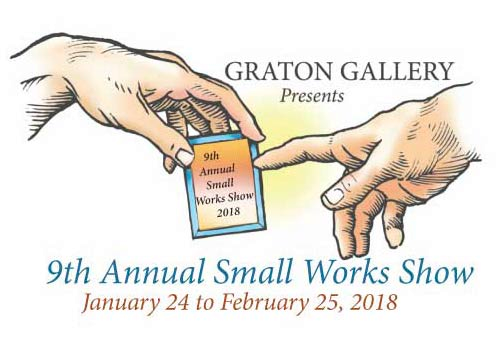 This exhibit showcases the diversity and creativity of nine Sonoma County artists, who's individual artistic journeys are richer for the sharing of knowledge and ideas with each other. 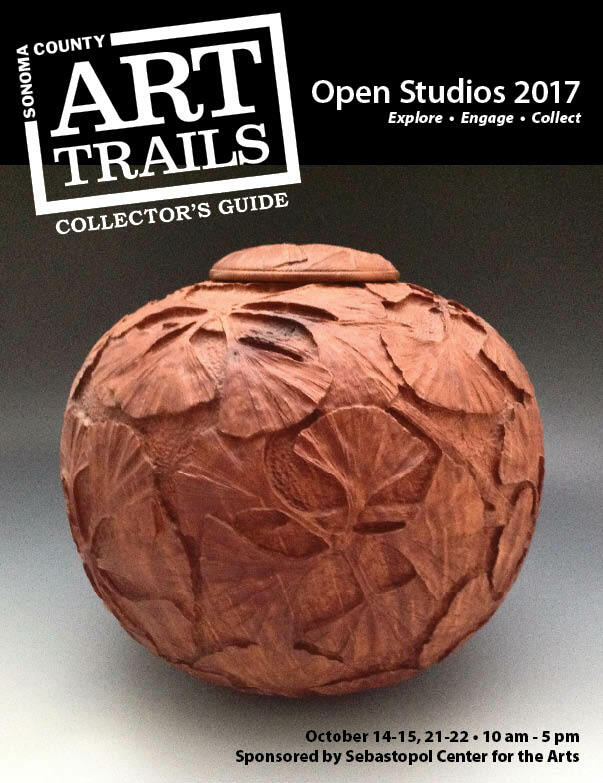 Due to the devastating fires that have rocked our community these past few days, Art Trails was postponed a week, but is still happening. Please come out and visit - 131 studios will be open. I am donating a % of sales to various local Relief Funds. As a way to help our fellow artists who lost everything, the Sonoma County Art Trails Artist Relief Fund has been established. Fountaingrove Round Barn ©Carolyn Wilson. Mixed media. 7"x7"
Many have a soft place in their hearts for this historic Sonoma County landmark. Tragically, Fountaingrove Round Barn burned to the ground on October 9 2017. The original painting just sold, but will still be available to view at my open studio during Art Trails. I have donated cash to the value of 100% of the purchase price to the Art Trails Artist Relief Fund. I am currently taking orders for fine art giclée reproductions of the painting, the income from which will also be donated to fire relief efforts. Please contact me if you would like your own copy as a keepsake of the Round Barn. Prices $50 and up. Joyful Spirit ©CarolynWilson 2017. 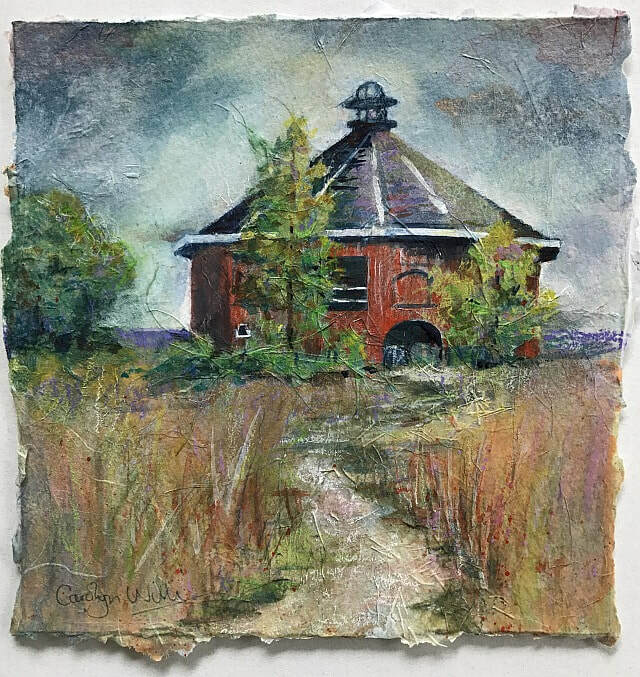 Mixed water media and collage on canvas 12"X12"
Art Trails is a way to see incredible art, meet the artists in studios scattered over the entire County, and tour the beautiful Sonoma County countryside all at the same time. The main preview exhibit at Sebastopol Center for the Arts, 282 S. High Street, Sebastopol, CA 95472 September 26 - Oct 23 2017. Solo show "Pieces of Me" - July 2017. Healdsburg. Mixed aqua media and collage paintings. Featured artist, Upstairs Art Gallery, Healdsburg. July 2017. 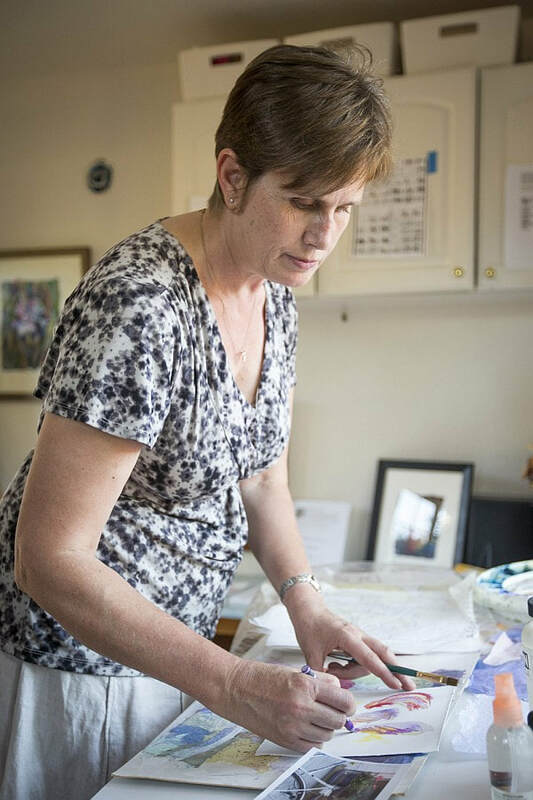 Full of personal history and layers of meaning, British expatriate Carolyn Wilson's current series of collage pieces capture aspects of her experience living and traveling in England. She says, "Communicating more than what is merely visible on the surface, my latest collage work incorporates ephemera, such as maps, printed words and postage stamps. The work is embedded with fragments of my life story - pieces of me. The mementos might end up being only partially visible beneath layers of paper, or completely hidden, but their inclusion is important to my creative process and the evolution of a piece. The viewer needs to take a close look to discover them." Carolyn's collage work has a tactile, fabric like quality, and contemporary style framing of paintings on canvas or wood panels eliminates the need for glass, allowing viewers to enjoy and even touch the rich surface textures. Many of Carolyn's new works are small in size, although equally as creative and detailed as her larger paintings. She stays fresh and challenged in her creative approach by experimenting with new materials, introducing elements of risk, unpredictability, problem solving and playfulness. 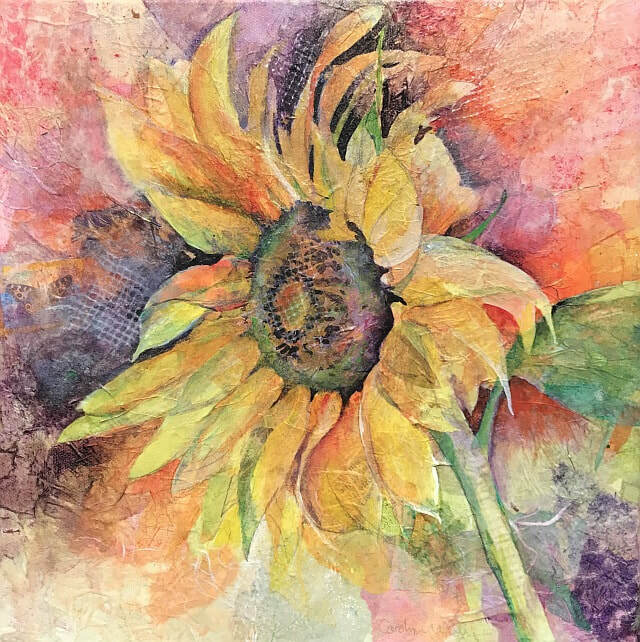 She uses a variety of aqua media, (meaning anything dissolved with water) such as watercolor, acrylic, inks and gesso in combination with collage elements of found or hand colored rice papers.